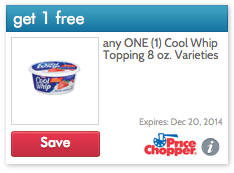 Price Chopper Festive Freebie Day One: FREE Cool Whip! Price Chopper will offer a FREE item for the next three days via ecoupon! Today's festive freebie is a FREE Cool Whip.